Everyone knows fall is the best season. It has the best weather, the best sports, the best outfits. Summer partisans are deluding themselves while they sit in pools of their own sweat. Only masochists love the deep darkness of winter. What is spring but bootleg autumn? The lack of extreme weather makes fall the perfect time to get outside and explore new places while having fun in new ways. In that spirit, here are 16 of the best things happening around the country this season, from slurping down oysters on a repurposed schooner to a Dia de los Muertos celebration that could only happen in Hollywood. 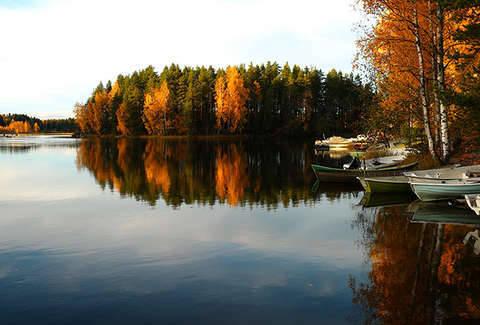 Leaf peeping isn’t just for New Englanders. Central Washington has some of the most show-stopping autumn reds, yellows, and golds in the country (colors peak in mid- to late-October), and the four-mile South Fork Tieton River hike right outside of Yakima is a highlight. 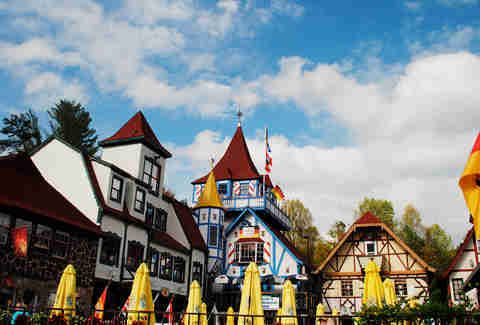 Yes, it’s the town from that episode in the second season of Atlanta and yes, it’s that German. On Thursdays through Sundays in September, and October 1-28, grab a maß of fest beer, a pretzel the size of a dachshund, and make sure to join in the indecipherable drinking songs. The Red Sox are red hot and are marching toward another run deep into October. Grab a couple of tickets -- if you can -- and catch a ballgame in the crisp Boston fall at one of the most iconic stadiums in all of sports. If tickets can’t be had, there’s no better bar to watch the game than The Baseball Tavern on Boylston Street, a Fenway-adjacent classic with a TV-equipped roof deck that has been serving Sox fans for over 50 years. 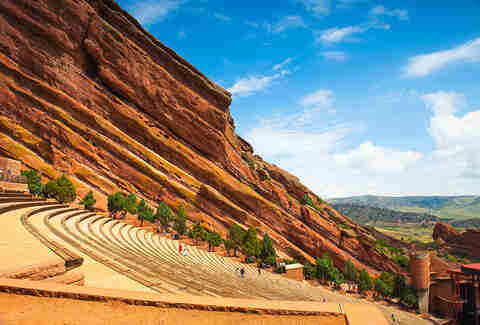 The unbeatable backdrop of the Rocky Mountains makes Red Rocks one of the best concert venues in America -- and the crisp, cool Colorado autumn is an ideal time of year to check out a show there. Highlights from the fall calendar include gigs from Beck (September 24-25), Lauryn Hill (September 26), The National (October 9), and A Perfect Circle (October 22). The best way to see the ochre and auburn tinged forests of New England is from above, so get yourself a hot-air balloon and commence the oohing and aahing. There are services launching from all over Yankee country including the Berkshires, southern Maine, and southern New Hampshire. A crispness in the air, leaves changing colors, and a sudden craving for pumpkin spice means one thing -- it’s flannel season. Whether you’re hiking trails or footballs, picking apples or fantasy players, grab an L.L.Bean flannel (and your friends), and hit the outdoors to make the best of fall (before it’s over). The rule of thumb when it comes to eating oysters is that you only slurp down the bivalves in months that end in “R” -- and also that you should eat them on a ship with an unparalleled view of NYC’s waterfront. 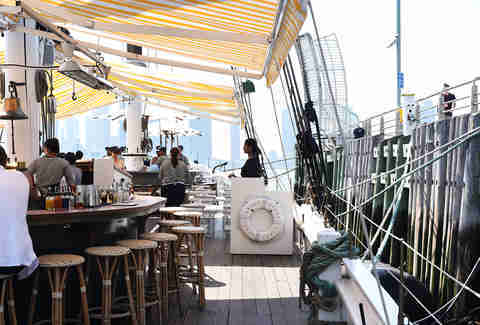 Grand Banks oyster bar, docked on the Hudson River in Tribeca, ticks both boxes. Just make sure you’re prepared to do battle with the crowds jostling for a coveted table and a dozen oysters. It wouldn’t be fall without getting lost in a corn field, so why not make it one of the country’s biggest maizes? (I’m so sorry.) The proprietors at Treinen Farm carve complex shapes -- past cutouts include some sort of shellfish and an elephant -- right into the field and let visitors lose themselves among the kernels. 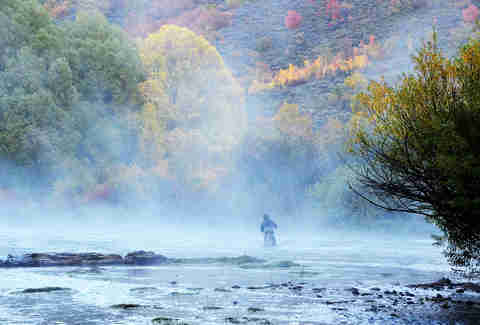 There’s good fly fishing to be had all over Utah but some of the best angling can be found on the lower Provo River about 30 minutes outside of Park City. Brown trout are the best catch around those parts, and they can be jumping by the time the leaves start changing. If you’re looking for a guide, Park City Outfitters has been serving intrepid anglers since 1989 and they provide everything you need from poles to waders. Did you know that all elk are deer, but not all deer are elk? Those are the kinds of facts you can expect to learn at the annual Elk Fest in beautiful Estes Park, a town nestled in the Rocky Mountains about 90 minutes northwest of Denver. Expect elk-related arts and crafts, elk-inspired bluegrass tunes, and elk face painting for the kids. Hate elk? There’s also plenty of elk-based cuisine! 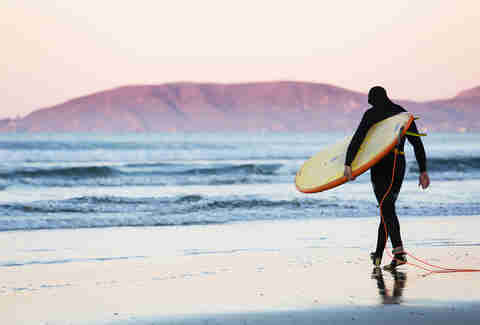 Fall brings some of the year’s best waves to the West Coast and you can catch some of the world’s best surfers take on the swells at the Pismo Beach Open on California’s Central Coast in October. Pack a sweater but please, don’t be a shoobie. Everyone has been dragged apple picking at least once in their life, but the folks at Pennings Farm a couple hours north of NYC do what God intended to do with all those apples: Make booze out of them. Their cidery produces more than a dozen varieties of cider from its own apples, hops, and other fruits, including Ginger Beet, Honey Razz, and Wild Man (which is fermented with wild yeast). Put on your best flannel and vest for a great, cider-fueled autumn day. 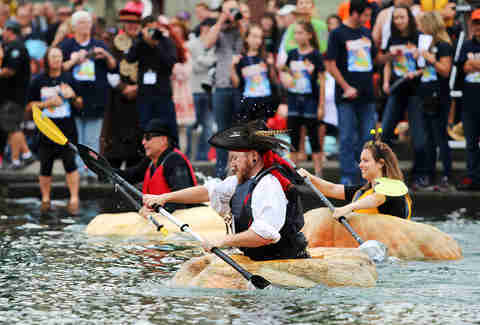 At the West Coast Giant Pumpkin Regatta, 20 participants hollow out massive pumpkins and then try to row them 100 yards across Tualatin Lake in this town half an hour south of Portland. What, you’ve never seen someone use a pumpkin as a kayak before? Celebrate all things hoppy and Michigan-y at the Detroit Fall Beer Festival. Now in its 10th year, the festival brings together more than 100 of the state’s brewers and throws a big shindig at Eastern Market. Come for the beer, stay for the Motown tunes. Where better to celebrate the memory of your ancestors than at Hollywood Forever Cemetery, the legendary burial grounds of Mel Blanc, Judy Garland, and Bugsy Siegel? Now in its 19th year, the celebration combines Day of the Dead traditions with a party atmosphere including food, music, and a whole lot of great costumes. The November race winds through all five boroughs and fosters a festival-like atmosphere throughout the city. Applaud the runners as they hit the mid-way point in north Brooklyn or cross the finish line in Central Park. Or, um, run it if you want!